Grades Kindergarten through 2nd have been working on projects that focus on improving their communication and collaboration skills. Design challenges included designing and building a table that could hold the weight of a textbook using only eight sheets of newspaper and one sheet of single ply cardboard. Students were also challenged to design the tallest tower using only index cards or cups. Later in the quarter we began studying simple machines. Students learned about levers, fulcrums and tension. With this new knowledge they were challenged to design and build "grabbers" that could pick up objects and drop them in a space three feet away. During this unit we focused on the make and improve cycle of the Design Thinking process. Our most challenging collaborative activity was building a six cup pyramid in groups of three or four. 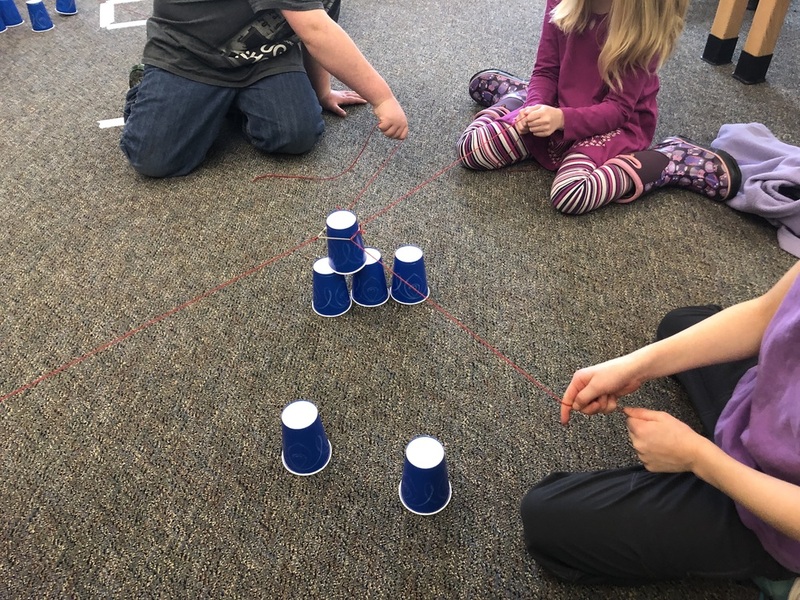 Students were only allowed to pick up cups using three or four strands of string (dependent on group size) and one rubber band (see article photo).